National carrier Turkish Airlines has started the big move from its hub Atatürk Airport to Istanbul Airport. The biggest transportation operation in the aviation history comes following the first opening stage back last October. Unique in the global aviation history, the moving operation will take 45 hours in total and it concludes tomorrow (April 6) at 23:59. Both the Istanbul Airport and Atatürk Airport will be closed for all passenger flights during a 12-hour time period between the final passenger flight of Turkish Airlines departing from Atatürk Airport to Singapore at 2am and the flight from Istanbul Airport to Ankara Esenboğa Airport at 2pm of the same day. Following this, the Turkish Airlines flights from İstanbul Airport will be increased in stages according to a set plan. Turkish Airlines Chairman of the Board and the Executive Committee M İlker Aycı said: "We are conducting the biggest transportation operation in the aviation history. So much so that during the move from Atatürk Airport which was the host of Turkish Airlines during its great rise in the global aviation to Istanbul Airport, our new home, the combined size of the equipment we are starting to transfer would cover the 33 football pitches." "We will continue to welcome our guests from all over the world with the unique service concept of Turkish Airlines with much wider opportunities provided by our new home after this great operation, which closely followed not only in our country and region, but also on a global scale," stated Ayci. 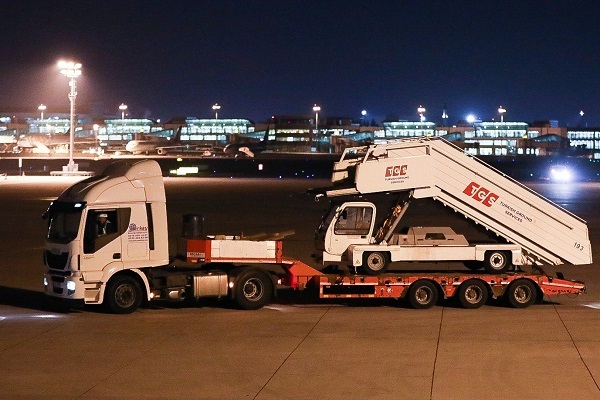 During the Great Move, equipment weighing approximately 47,300 tonne will be carried to Istanbul Airport from Atatürk Airport. From aircraft towing apparatus weighing 44 tonne to extremely sensitive materials, over 10 thousand pieces of equipment are equal to freight of 5 thousand trucking rigs. The distance covered by the rigs carrying this load during 45 hours is calculated to be at 400,000 km, which equals to circling the earth 10 times. The Turkish carrier said more than 1,800 personnel will be working during this great operation. Following the first opening stage, the additional passenger flights of Turkish Airlines from Istanbul Airport were listed with ISL code, said a statement from the airline.